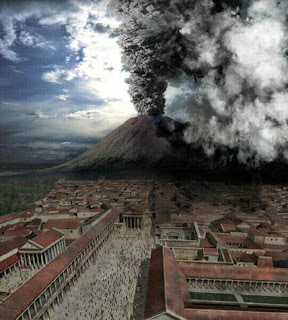 MISSION ESL COMPUTER LAB: "The Vocano is Destroying Pompeii", from Edcon Publishing. "The Vocano is Destroying Pompeii", from Edcon Publishing. People you will read about: Pliny; a famous writer of history. Tacitus. A famous writer of history. 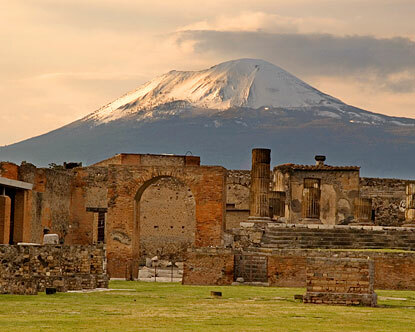 Places you will read about: Mount Vesuvius: A volcano near Naples. Naples: a port city in southern Italy. 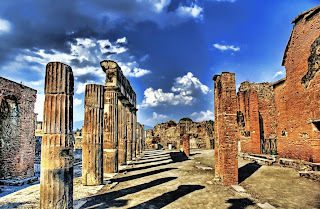 Pompeii: an ancient city near Naples. Something you will read about: Lava. Hot, melted rock that comes from a volcano. I fear I have sad news to report. As I sit here writing, my eyes keep wandering across the Bay of Naples. There, at the foot of Mt. Vesuvius, I see what is left of the once beautiful city of Pompeii. The fertile farms that once covered the green slopes of Vesuvius with fruit trees, grape vines, and pasture grass are no more. The beautiful public buildings, theaters, and summer homes of rich citizens are no more. And I fear that the city of Pompeii itself will soon be no more. For Mt. Vesuvius has exploded. The volcano that had been silent for thousands of years awakened a few hours ago. Now, at this very minute, it is destroying Pompeii. I begin to wonder if the earthquakes that have been striking Pompeii for the past sixteen years weren't some sort of warning. If they were, the citizens of Pompeii chose to ignore it. They refused to abandon their city. And after each earthquake, they repaired the damage to their city and hoped that the earthquake was the last. Even yesterday's earthquake, the strongest one yet, was ignored. And that proved to be a horrible mistake. For at noon today, the earth began to shake harder than it ever had before. Soon a strange-looking white cloud, shaped like a pine tree, appeared over the top of Mt. Vesuvius. Next came a terrible rumble from inside the mountain, then a huge explosion. Before the astonished citizens of Pompeii knew what was happening, a shower of burning stones shot up into the air and came flying down on them. The white cloud turned black with the ashes from the explosion. Lava started flowing down the mountain towards Pompeii. People were frantic. Those who were outdoors rushed in. Those who were indoors rushed out with pillows tied on their heads. Panic filled every heart. Soon the whole mountain was covered by black smoky clouds. They were poisonous sulphur gases. Everything in Pompeii grew dark as the sulphur settled on the city. The earth continued shaking, sending buildings to the ground and starting fires. Thick ashes continued to fall. Lava flowed in, crushing roofs, and burying people who had died from the poisonous gas. As I stare at this scene, I wonder if I am about to witness the end of the earth. I see frantic people running and screaming in all directions. What should they do? Should they stay in Pompeii and hope the volcano will stop? Or should they flee, abandoning their homes and all their possessions? Some head towards the sea. But boats docked at the wharf cannot leave because of the huge waves caused by the earthquake and the flowing lava. What will become of these people? I do not know. What will become of Pompeii? I do not know. But, my dear friend Tacitus, I promise to write again with more news of Pompeii, for I know how interested you are in recording events of history. After reading Pliny's letter, you're probably curious about what became of Pompeii. For eight days and eight nights, Mt. Vesuvius continued its dreadful explosions. Its ashes grew thicker and blacker. Its lava rolled down the slopes, pouring through doors and windows and finally burying every rooftop. Although some people managed to escape before the panic started, the 18,000 people who ignored the warnings perished under Vesuvius's ashes. In time, twelve feet of lava hardened over Pompeii, followed by another six feet of earth. Pompeii had vanished completely. It may seem difficult to believe that a city could be buried for 1,700 years. But Pompeii was. It was not discovered again until 1738. Then, peasants digging at the foot of Mt. Vesuvius, came upon some statues. Trained teams of diggers took over. They uncovered vases, bowls, tools, food, and parts of buildings. 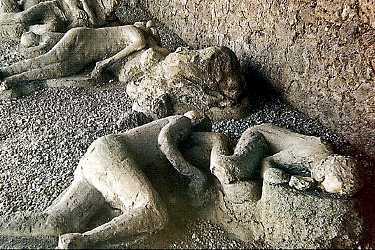 Even the forms of bodies had been preserved by the hot coals and ashes that had settled on Pompeii. Frantic expressions frozen on people's faces showed the panic they must have felt when the poisonous sulphur began to choke them. A cook was frozen putting his breads into the oven. A grocer was frozen setting out beans on his counter. A woman was frozen arranging needles and thimbles in her sewing kit. A dog was frozen tied to a post where his master had left him. Women were frozen grasping their jewels as they tried to flee. Children were frozen clutching their mothers for protection. A rich man was frozen holding the key to his locked garden gate while his slaves carried his money and valuables behind him. Workers uncovered more of the ancient city. Then scholars tried to learn its name and its place in history. No one in Naples knew the facts about a city at the foot of Mt. Vesuvius that had been destroyed by a volcano. So scholars turned to long-forgotten books and found the letters of Pliny and Tacitus. Pliny was seventeen years old when he witnessed the end of Pompeii. We are glad that he wrote about it to his friend Tacitus. And we are glad that their letters were preserved. Because of a letter like the one you just read, scholars have learned much about a city that lived and died almost 2,000 years ago. Comprehension Check. Choose the best answer. a. a city covered with lava and ashes. b. a city of fertile farms and beautiful homes. c. a city destroyed by many earthquakes. d. a city on top of a mountain. a. Pliny, who wrote the letter. b. the rich citizens who lived there. c. sixteen years of earthquakes. d. the farmers on the slopes. a. it had exploded just sixteen years ago. b. the earthquakes should have stopped it. c. there was nothing inside the mountain. d. it had been silent for thousands of years. a. a sign that it would rain. b. a mass of poisonous sulphur. c. a large, burning stone. d. a forest fire on the slope. a. to keep from bumping into each other. b. to protect themselves from falling stones. c. to keep away the poisonous gases. d. to show they weren't afraid of volcanoes. a. their captains were afraid to sail them. b. they were all on fire. c. the waves were too high. d. too many people were on board. a. a group of mountain climbers. b. a student of history named Tacitus. c. peasants digging at the foot of Mt. Vesuvius. d. scholars drawing new maps. a. questioning people in Naples. b. reading the letters of Pliny and Tacitus. c. finding the people who had escaped. d. checking in an encyclopedia. a. "The Volcano That Slept Forever." b. "Building a New City." d. "A City Frozen in Time." a. a city that dug itself out after a volcano exploded. b. a volcano that buried a city for 1,700 years. c. the daily life of the citizens of Pompeii. d. a seventeen-year-old boy who wrote interesting letters.